Looking at this map, Manhattans Community Board 4 is a library poor community. Our community will be growing with the addition of new High Line buildings construction, the Hudson Yards and Manhattan West. And some of the libraries we have are already short of space. Adding more libraries to our community will be a very expensive proposition costing millions of dollars and even if money is made available will take years to get implemented . However adding Outdoor reading rooms to our libraries and community open spaces can be done at a very low cost, and in a very short amount of time. 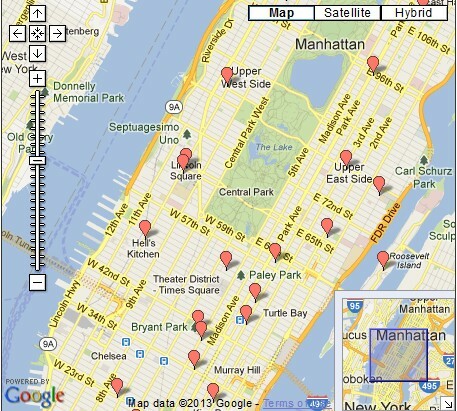 There are 5 libraries from 14th St to 110th St, 7th Ave to the River. There are over 40 parks and playgrounds in the same area. 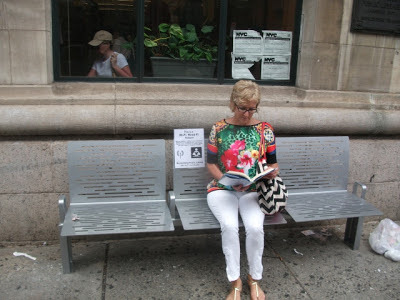 - Place a bench on the sidewalk outside of a library. The library now has an outdoor reading room, backed up by a collection of thousands of books. . However not every will realize that it has this function. The bench shown in front of the Muhlenberg library was installed by the NYC Department of Transportation as part of its Citibench program. 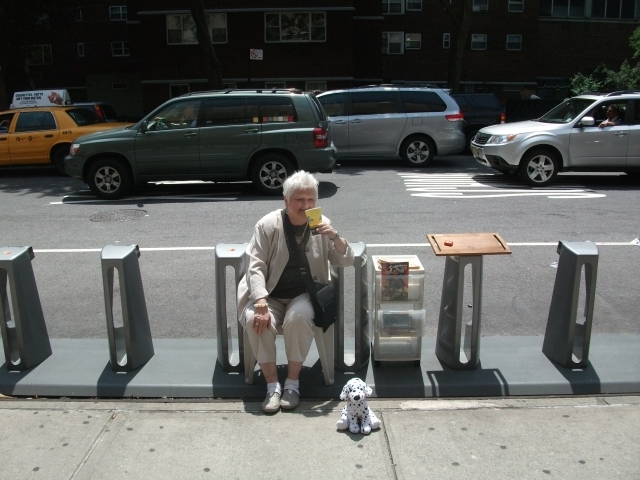 1500 benches will be installed in NYC as part of this free street furniture program. 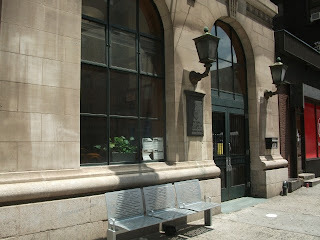 Any library can request a bench to be installed in front of it . This creates the potential of adding hundreds of outdoor reading rooms throughout NYC, simply by filling out Citibench request forms. 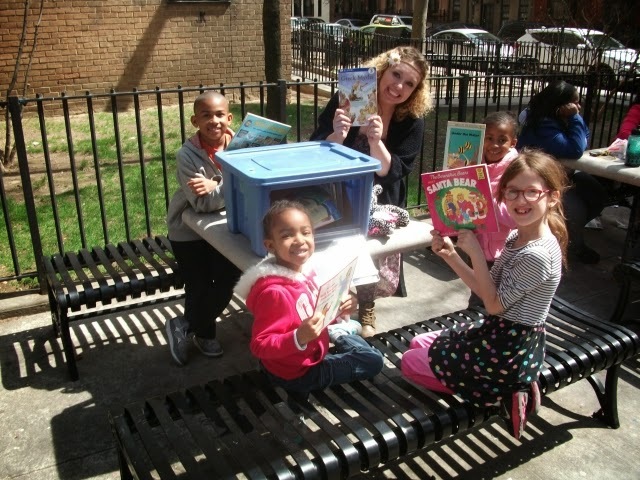 Urban Librarians Unite has been coming to the rescue of book-loving residents in many of NYC’s Hurricane Sandy-hit neighborhoods. -Place a cabinets in parks that have staff supervision, to close the cabinet at nights and when it rains. -To make sure there is always new reading matter swap some material on a weekly basis . Take a basket of books from location A move to location B, the B basket goes to location C, the C to D etc. -Allow community residents to add books and magazines too. This is the Bryant park Outdoor Reading room. It is stocked with reading materials. 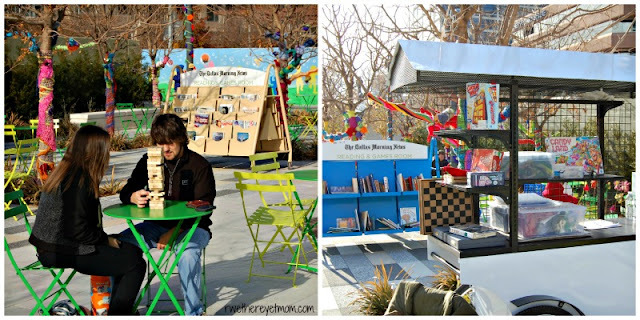 Bryant Park acts as an outdoor reading room for the NYPL Mid Manhattan and 42nd St building. But there are also several secret outdoor reading rooms in the area. At 445 5th ave @39th st, around the corner from the Mid Manhattan Library is this Secret Outdoor Reading Room (aka privately owned public space) that could better serve as an outdoor reading room for Mid Manhattan, if people only knew about it! The Uni Project is working on a new version, that will hopefully be weather protected. The Tel Aviv-Yafo Municipality The portable library at Metzitzim Beach in Tel Aviv. Gone to the beach and forgotten your paperback? If you’re in Tel Aviv, at least, you’re in luck. Israel’s largest city on the Mediterranean just opened its first beach library, a portable cart stocked with more than 500 books in five languages including Arabic, English, French, Hebrew and Russian. The library is free for all to use. We operate on the honor system and only ask that if you borrow a book please return the book. Or feel free to add a book to the library. We want to make sure that everyone who wants to is able to enjoy the free library.The library has no operating funds. 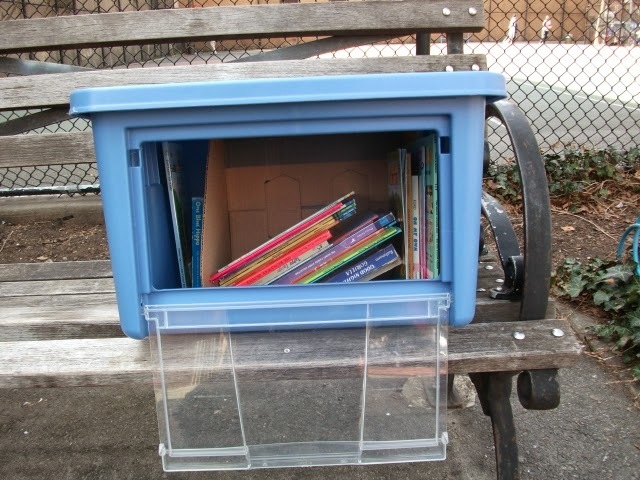 Maintenance and upkeep of each Little Library is taken care of by volunteer library stewards. We rely on borrowers to return their books and on book donations. Magazine and Newspaper racks designed for an outdoor reading room in Atlanta. The structures are mobile, visually appealing, and withstand the elements with an all aluminum construction. 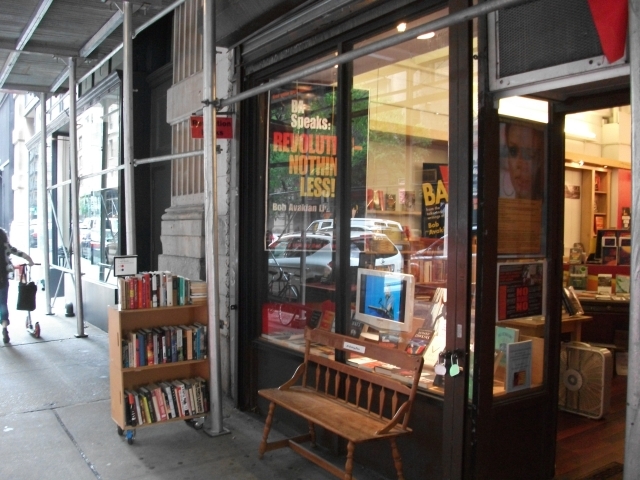 There's an eclectic collection of books for sale outdoors at Chelsea's Revolutionary Books, and a bench is also in front of the store . Currently the books are only for sale, but anyone can sit on the bench. Adding a few words to the bench, "sit down and browse our "books for sale" would both increase sales and turn the spot into an outdoor reading room. In Westbury-sub-Mendip in the county of Somerset, United Kingdom, the traditional red phone booth has been recycled into one of the country’s smallest lending libraries, stocking hundred books. The villagers can use the micro-library 24 hours a day, selecting books, DVDs and CDs. The idea is simple: users leave an item (a book they’ve read, for instance) and take one item. When Westbury-sub-Mendip lost its phone booth and mobile library at the same time, a resident of the village came up with the idea to re-use the booth as a small book center. It became a big success. The council bought the phone booth from British Telecom for £1. Meanwhile, the telecom company has received “770 applications for communities to ‘adopt a kiosk’, and so far 350 boxes have been handed over to parish councils”. Classic red phone booths have been turned into art installations, a shower and even a public toilet. CPL’s BookBox: Shop the Market. Pick up books. If you’ve been to Ohio City’s Market Square recently, you’ve probably noticed the giant box in the back. This is none other than the Cleveland Public Library BookBox, a mini library where you can check books out or pick ones up, all while shopping at the West Side Market. The BookBox will be open on Saturdays from 9am – 1pm. The Woodruff Park Reading Room is an open-air reading room in northern portion of Woodruff Park. In partnership with the Atanta- Fulton Public Library, carts are stocked with a selection of books, periodicals and newspapers, with readings and programs at lunchtime. Movable furniture creates an intimate environment. The programming, publications, and environment of the Reading Room are available to everyone for free, without any need of cards or identification. 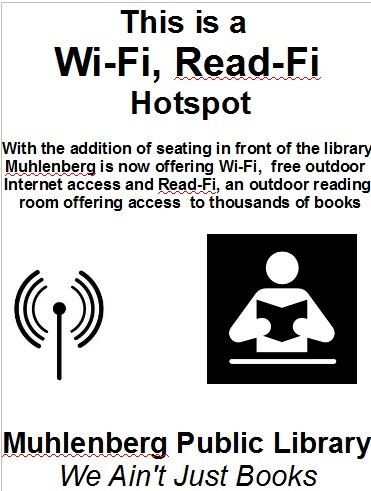 The Muhlenberg Library is short of seating. Building a new library for seating is expensive. Adding pickup lockers to Community Locations with seating, would turn them into extensions of the library, at a fraction of the cost of creating a new branch. Can't get to the Library during regular business hours? Try our after-hours pickup service! When you reserve materials in the library catalog, you have the option to have your items placed in a locker outside Old Worthington Library or Northwest Library for pickup after the library is closed. All you have to do is select a locker location when you place your reserve request. (Look for "WL Northwest After Hours Pickup Locker" or "WL Old Worthington After Hours Pickup Locker" in the list of pickup locations.) When your item arrives, it will be placed in a locker and you'll be notified it is available for pickup. When picking up your items, use the keypad to enter 9 plus the last six digits of your library card number, followed by the pound/number sign (#). Note that items are checked out to you the day they are placed in the locker. If your reserve has already arrived and you'd like to pick it up in a locker, just call 614-807-2626 during regular business hours. Please have your library card number ready. Your materials will be placed in a locker for you to pick up outside either Old Worthington Library or Northwest Library. Foster Elementary has Pickup Locker! Great news! Our Library LiNK initiative continues to expand to provide access to library materials and resources in the community. Foster Elementary now has a locker and book drop located just outside their main entrance. Patrons in this community can have items sent to the secure lockers by selecting Foster as their pickup location, and return library materials in the outdoor book drop. Because they will get an e-mail with an access code to open the lockers, an e-mail address will be needed on their account. It’s also our first 24/7 accessible location since the locker are located outside. It joins TCC Southeast Campus and YMCA South Cooper Branch locker locations. Need library items but can’t make it to the library? Try our pick up lockers. Call the library your local MCDL library with your library card number ready. In Colorado the Aurora public library, created this satellite library in a K-mart. It offers computer terminals and item pickup/return. An outdoor reading spot is any place you can comfortably read outdoors. If it has a selection of reading material it is also considered am outdoor reading room.